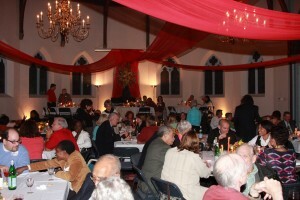 The Big Din – November 17 at 5:00 p.m. The Big Din is on! Put Sunday, November 17, on your calendar for the night of the Big Din. We will return to our theme of being thankful – but don’t expect turkey for dinner! Anne Marie Senior has again agreed to be our head chef and we are excited. The suggested donation to offset the cost of the meal is $10/person with a $30/family maximum, but if that is an issue for you, please email the Rev. John Mennell by clicking here. We begin at 5:00 p.m. at the rectory for appetizers and beverages and then move to the Assembly Hall for dinner at 6:30 p.m. We hope to see you there as this is a joyous way to spend time together. For more information, please contact info@slechurch.org or click here for more details about the Big Din.